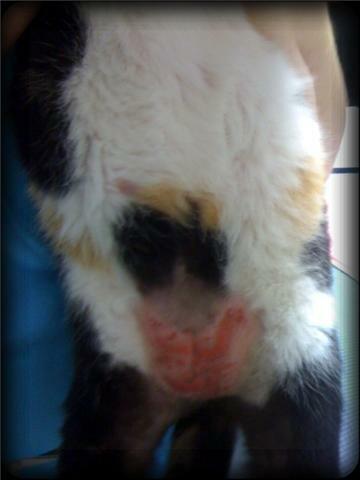 Sheila was a four-year-old spayed orange-black -and-white short-haired cat with a nasty red bumpy rash on her stomach. This painful rash appeared spontaneously, not as a result of licking. 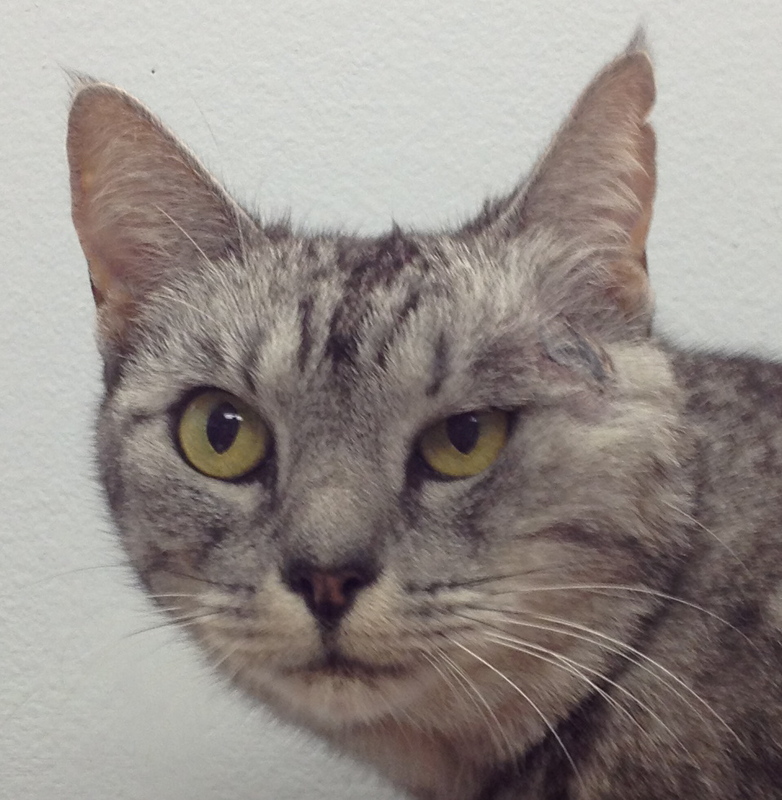 Sheila also had tiny red bumps lining the edges of both her ears. She licked her belly throughout most of the night and had barbered the fur on her belly down to a fine fuzz. She hated having her ears, paws, or back touched, and was generally, difficult to comfort or show affection to. Like most cats with her symptoms, Sheila ate well. Occasionally she would vomit just foamy liquid, or a little hair from licking too much. She liked to sit and look at birds outside the living room window and liked to rub against her people’s legs in the kitchen to meow for food. “Doctor, this rash just showed up,” said Sheila’s mom. “Let’s take a look,” said Doc Truli. The fur on the lower abdomen was licked short, almost bald. The area of the rash was red, heat exuded off the surface, red raised, patchy, almost serpentine patterns coalesced. A shiny, sticky, clear film coated the surface, cracking in spots where it had dried to the rash. Clearly, this kitty was uncomfortable. 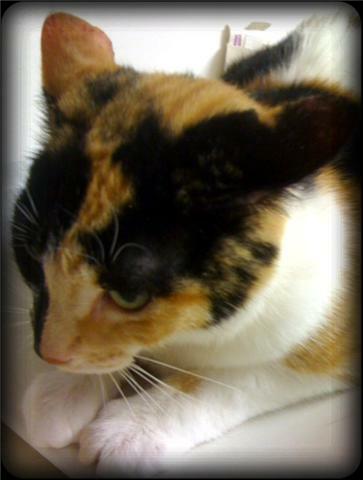 This color combination is called “calico.” If even one speck of white fur or pink pad shows, a “tortoiseshell” automatically becomes a “calico” for show purposes. Doc Truli performed a three-slide technique analysis of the skin. Three slide technique in veterinary dermatology includes a microscopic examination of samples taken with tape, a skin scraping, and ear swabs, all three samples placed on microscope slides and analyzed. In addition, a black light trained to the area for a few minutes will excite the electrons inside 50% of ringworm fungi and make them glow a brilliant light green color. The skin reacts to the assault by becoming inflamed. 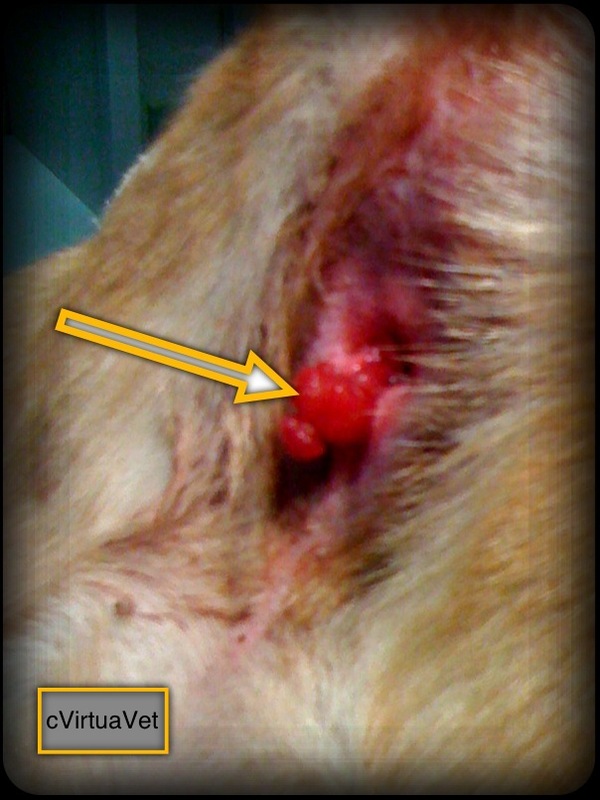 The redness, swelling, and heat felt over the area, combined with the pain and discomfort of the cat show inflammation. The inflammation is a reaction to the skin being attacked. The inflammation does not offer the answer we’re all looking for: What is making this cat itchy and rashy? In Sheila’s case, the tape impression cytology showed masses of immune cells called eosinophils (pronounced: ee o sin o fills). These immune cells fight allergies or parasites. Since Sheila’s parasite tests came out clean, allergy was left. 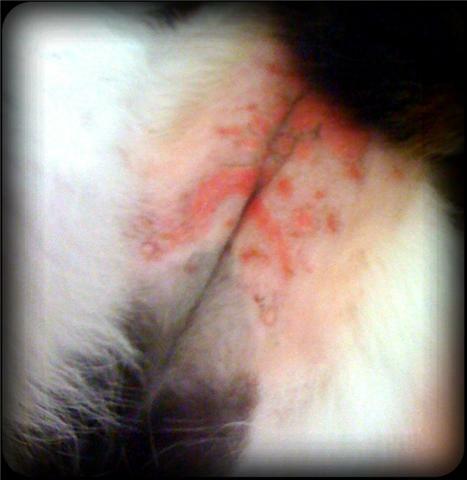 For some unknown reason, many cats break out in red, itchy rashes when they suffer an allergic attack. If the rash is seasonal, meaning only at certain times of the year. And if the rash is not present throughout the year, then a seasonal allergy becomes more likely. Let your veterinarian know if you have seen a pattern to the itchiness or rash. Your veterinarian can run allergy tests (whether skin tests or blood tests), or can try trials of various medications to help the skin settle down. Sometimes a masking treatment of the symptoms, like a steroid shot, can also be a test. If your cat receives a steroid shot and the symptoms completely clear up, then an allergy is likely. In Sheila’s case, her folks did not want to invest in $150-$200 worth of allergy testing and allergy desensitization shots. They opted for a long-lasting steroid shot of methylprednisolone. They chose not to go with an oral medication like prednisolone, because Sheila hated taking pills and would refuse to do so. Never take medication, especially steroids, lightly. Cats are more immune to the side effects of steroids than people or dogs. But real risk still applies. Can't you see by my ears that I'm annoyed? First of all, steroids are not FDA approved for use in cats in the United States. They, along with about 80% of pet medicine, are prescribed as an “off-label use.” “Off-label” means the research may be good, doctors have been prescribing it for a while, everybody thinks they know the doses and benefits and risks. However, an off-label drug has not been put through the expensive, intensive US FDA process of formal drug approval for that species of animal. In cats, prednisone, prednisolone, methylprednisolone, and other steroids, have been reported by researchers to unmask hidden heart disease. Approximately 15% of cats may be walking around with cardiac muscle disease with absolutely no outward signs or symptoms. If your cat is one of these cats, a steroid could precipitate sudden decompensation of the heart, and lead to the symptoms of heart failure and sudden death. 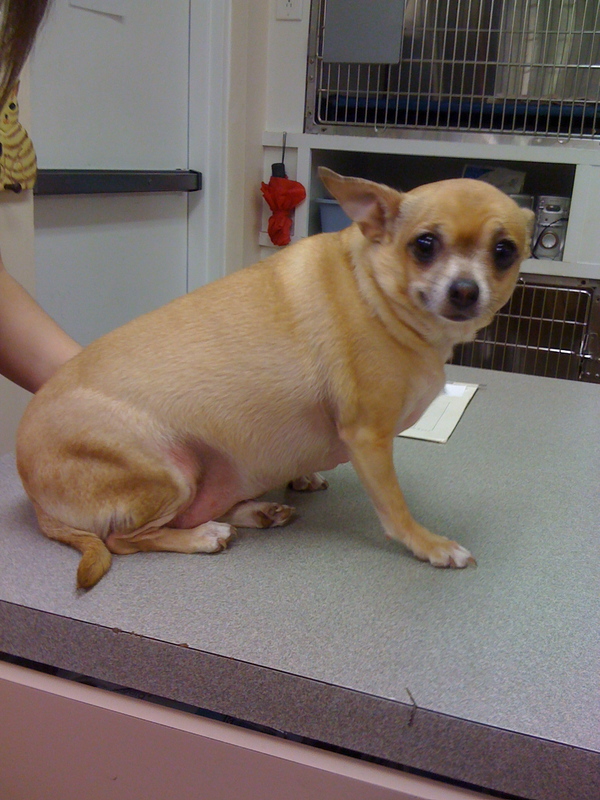 Your veterinarian may recommend cardiac health screening before prescribing a steroid. A cat with hidden cardiac disease may get a steroid shot, and then later in the day, or later that night, start open mouth breathing, panting, gurgling chest and breath sounds, maybe start foaming at the mouth, bellowing the chest and ribs in and out trying to get more oxygen into the lungs. The tongue may look blue. Without treatment, the cat will die. With treatment, some die. If you see any symptoms like these in your cat, stop reading this and go to an emergency pet hospital or call your veterinarian right now! The other well-known, possible side effect of a steroid pill or shot in a cat, is diabetes mellitus. The steroid can trigger diabetes in cats. The cat will start drinking and urinating a lot. The urine will be sticky and have a sickly sweet smell. The cat may eat a lot and act hungry all the time. Luckily, the diabetes is transient and will resolve with treatment and with discontinuation of the steroid. Call your veterinarian if you see these symptoms. These side effects are thought to be uncommon, but you should know they are possible. Sheila got her methylprednisolone steroid shot. The next day her ears stopped itching. Two days later, her belly skin looked pink, instead of red. Within a week, all the rash was gone. Until the underlying allergy is discovered, the rash may come back. In the meantime, Sheila is one happy kitty! ← Help! My Dog’s Mouth Smells Bad! My vet suggested switching to stainless steel dishes and eliminating plastic eating dishes. Some felines are allergic to the plastic. I wonder if it’s not a true allergy, but just bacterial filth. Let me explain. No matter how much you soak/wash/sterilize plastic, the molecular structure holds bacteria. No wonder the kitties get a chin rash and sometimes a rash everywhere they lick and groom, especially their bellies. Just a thought. I adopted this little 4 yr old cat from a shelter the only background story that i have on her is that she lived in a house with two full sized blood hounds that she was terrified of. The owners gave her up because she would soil their bed sheets and linens. So far I have not seen this behavior in her. When I got her she had a history of a low grade respiratory problem. I’ve been prescribed antibiotics for her and it cleared up but then she got this awful rash on her stomach it doesn’t seem to pain her and she doesn’t scratch except for behind her ears but there is no rash there. Her fur is falling off. Which is very noticeable because she is long haired. She is just the same energetic kitty as ever. I was wondering if possibly she is allergic to the antibiotics my vet gave me for her. It is called Viralysis.I also have been giving her Laxatone because at first she could not go to the bathroom on her own. I was also recommened to give her a multivitamin to boost her immune system against a relapse of her respiratory problems. Should I not have done that? What did the veterinarian say about the hair loss? I lived in the Caribbean for many years and self diagnosed with subcutaneous filariasis about 6 months (Mansonella Ozzardi) which I have had for 5 years. very difficult but finally found specialist who confirmed my diagnosis last month after 5 years of seemingly unrelated annoying symptoms (which worsened in the last year or so) and several docs/ERs dropping ball when I told them I had a parasite and in 3 cases, which one). MY CAT also broke out in macules same time I did, on her belly, that itched her like mad. I am 99.9% sure she has the same parasite as she too has responded to ivermectin (which kill microfilarae) So just want to point out that parasite as an underlying cause is def. worth checking. 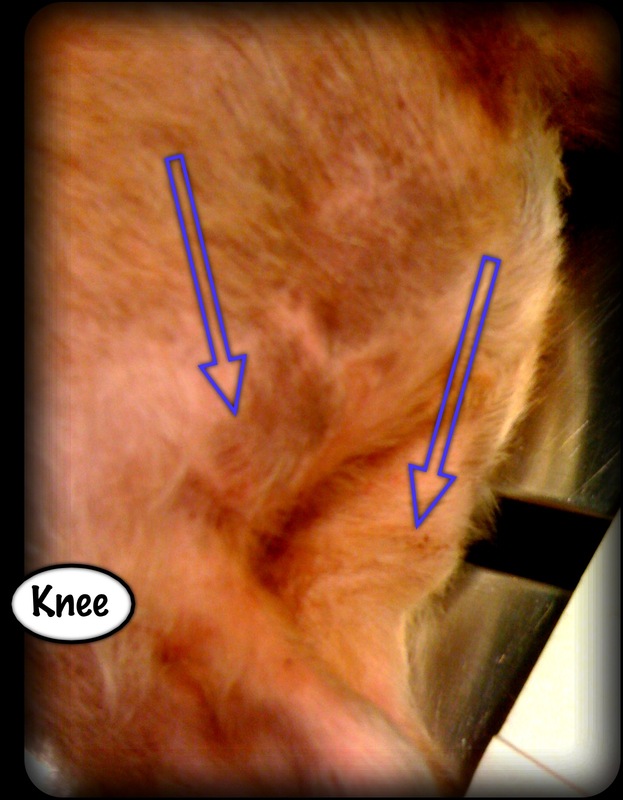 (Kitty going to vet again soon, the first vet was completely wrong when he said it was just hot spots.) This type of ilariasis is spread by sand flies, which are plentiful along the south eastern US coasts and of course the tropics world wide. This side effect of feline heartworm disease is not well-published in veterinary news in the US. I will look into it. Sounds plausible. Our Long Haired Norwegian Forrest Cat had a very severe “Belly Rash” and after costly vets fees we tried “Derm Opt” active ingredient Thrixsolene. Hey presto it cured it, and also helped clear other “alergy” issues. So don’t mess about get Derm Opt (Shampoo or Spray) it sorted our cats “belly rash” problem without doubt. For everyone not in the UK, thrixolene is a proprietary formula available on the UK that can heal rashes. There are literally 100’s of products that can heal the skin. Different formulas are available in different countries. It does not surprise me that your kitty got better in spite of the vet’s ideas. 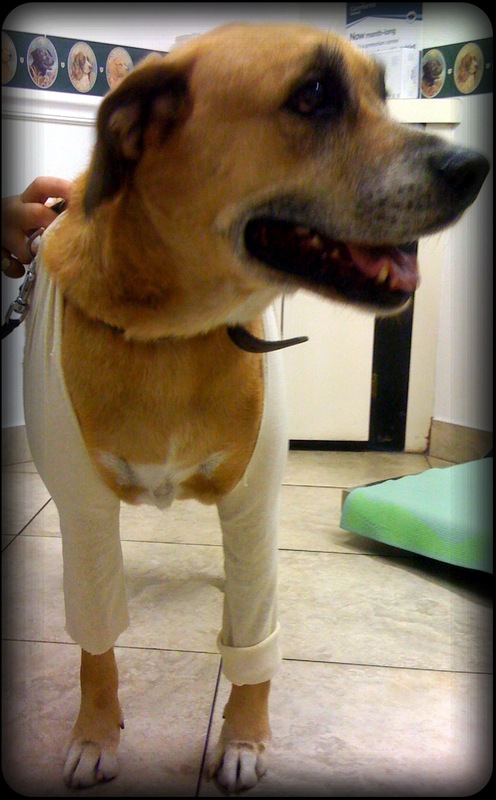 I have learned through years of helping animals heal, there are many paths to a solution. If one path is closed to you, instead of becoming angered and obsessed with that one path, feint sideways and go a different way. No one owns one cure-all! My 7 year old cat Tipsy is having the same problem. We went to the vet and she got a shot and some antibiotics and it looked great. Then within a week its been back. She is drinking the same water and eating the same foods she always has been. She is flea free. The difference is now she can venture outside. She absolutely loves it and I have no way of keeping her in because we have a dogie door. The problem is I am a full time student and no income other then student loans so I cant afford to take her back. I gave her a benadryl for the first time tonight to see if that helps. I clean it daily and rub some of the ointment the doc gave me on it but she just licks it off. I tried putting a cone on her but she nearly killed herself trying to get it off and she will not tolerate it. Other than this I dont know what else to do anymore. Ask your vet if prednisolone (an oral steroid) would be appropriate. If it is, it is waaaay cheaper than steroid shots. it keeps them from getting blocked. Interesting tip. I too, have seen good effects from distilled water. There are no studies to show that distilled water helps prevent urinary tract problems in male cats, but it doesn’t hurt. I have also heard pet parents tell me that I do not recommend dental cleanings in years they use filtered or distilled water. When they use tap water, I notice bad breath and tell them to get dental cleaning done.